#telic1 adventures continues next schoolyear. Here's my assignment - project report. With my report deadline coming up, I started listing my references. 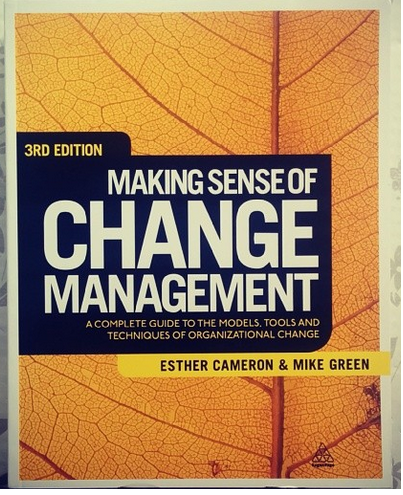 One book I've not mentioned is "Making Sense of Change Mangement" by Esther Cameron & Mike Green. I find it particularly interesting because it is a very readable, practical but theoretically underpinned book on a variety of frameworks and models about change and transformation. What did I select from this book for my change project? The work of Carl Rogers. I focused on this condition in my approach for the project. Unconditional positive regard: an acceptance of whatever feelings are going inside the members of the change project. I can honestly say that the teachers involved in the project can have mixed or negative, or positive feelings towards the innovation. 3. internalizing new concepts and meanings. What is a group, and when is it a team? Morgan et al (1986) suggest that 'a team is a distinguishable set of two or more individuals who interact interdependently and adaptively to achieve specified, shared, and valued objectives.' Groups, on the other hand, are a collection of individuals who draw a boundary around themselves. A team is, generally, toghter and clearer on its common purpose (Cameron & Green, 2012). > It is good to think about and analyse this some more. I have a mix of "a group", and some are "parallel teams". Parallel teams are not part of the traditional management hierarchy, they run parallel to the existing structures. The setting of the micro-design teams in my project are setup like this. I'm listing all of my references in this googledoc. The research tool is great for automatically listing your references. A lot has been written on change. 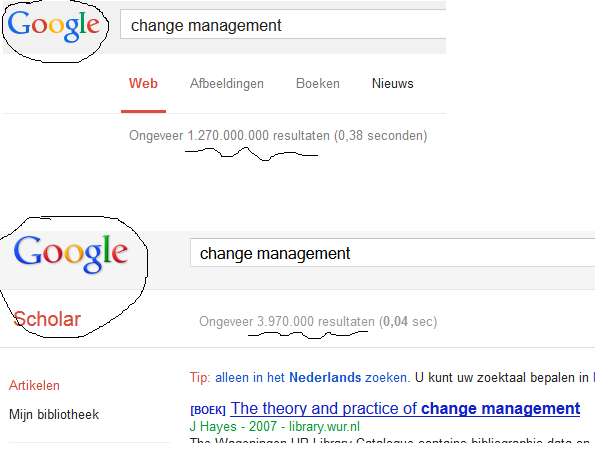 It looks like a lot of people are learning about change. It seems that everybody is concerned with wanting people to change. Why is that? Is it a kind of quest for the holy grail of control? If and when we understand how change works, then we can influence how humans change. And, ultimately, we have control over what happens; we have guarantees that innovations are effectively realised? According to me there is a paradox in the notion of “change management”: is it possible to “manage” “change”, or is this an unchangeable process? I am currently reading Can You Teach a Caterpillar to Fly by Jan Bommerez. I was intrigued by the white-print thinking of de Caluwé and Vermaak. "In white-print thinking, the dominant image is that everything is changing autonomously. It is nourished by chaos thinking. Where there is energy, things change. White denotes openness." I had the book of Jan Bommerez for some time on my book-shelf but this tweet triggered my reading it. "Retaining always has to do with resistance"
Our main assessment task in IC2 is a change project in our workplace. 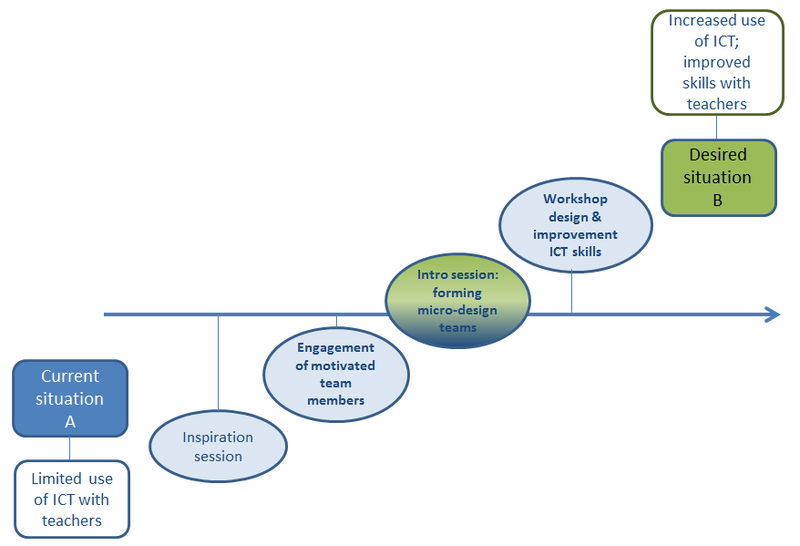 The project I chose was the professional development of a group of about 15 teachers on blended pedagogy using ICT. The context of the project, goals and project plan in this googledoc. evaluating change in a closing session (tenacity). We are now mid-way. The tools and assignments were provided on this blog, and we come together again on May 15th. As diagnosis of change in this project I created a force-field analysis. A force-field analysis maps the factors that influence a situation. Helping forces and hindering forces of the change process. Reflecting mid-way on this process, it seems that the inhibiting forces of “time” are winning. 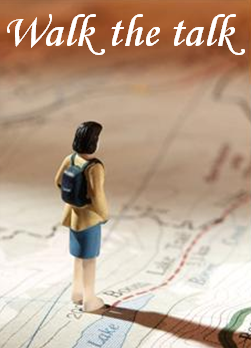 There are little communicative signs that prove their learning with the distance learning assignments. We decided to use twitter as a tool for communication and questions but I’ve only spotted a couple of tweets with the appointed hashtag. It looks like the condition ‘connectivity’ is not easy to foster. The fact that everybody involved is really busy in their own workplace context and “time flies” are probably the most hindering factors. These are my assumptions for the moment, we will take this up on the 15th May and I will reflect on this later on, in my project report. Ben Tiggelaar with some of his thoughts on the psychology of change. First, he stresses out the importance of both sides of the transformation coin: “Think differently” and “Act differently”. In a transformation you want people to start thinking differently and to act differently. Every side of the coin has got three elements that matter. What people believe is hard to change. It is not because you’ve come up with some change idea and strategy, that people take this up. Study what values and beliefs employees/people have, and start linking those with the direction of the change you have in mind. Efficacy: the belief in your ability to succeed in a particular situation. When people don’t believe that they are capable of doing what you ask in the change project, they will not change their behaviour when you’re not around. Perhaps they will act on the change when you in the neighbourhood, but they will download to the old routines when you’re not around. People imitate others. We are social beings and closely look at what others do. Statistics, numbers and strategies in PowerPoint are interesting but when people on the workfloor don’t “walk the talk”, others will not move towards the direction of the change. Make sure that enough people act on the change you want to see. Make the abstract output goals of the change project concrete in “actions in-the-now”. What does the desired result in the future mean for actions now? Not easy, but the possible change in behaviour is increased with factor 10 or 11 when these abstract output goals are translated into concrete actions. Develop and apply techniques for change in behaviour. One important technique concerns the (social) environment in which people work. Change the social and physical environment in which people work, and they will more likely change their behaviour and way of thinking. They will more likely change their behaviour than when you only try to let them think differently. Evaluate continuously. The third aspect is about giving feedback during the (learning) process of transformation. Don’t wait until “the end” to evaluate the change project, but be aware of the process of the transformation. A transformation is in essence a learning process. Don’t focus too much on the outcome of the learning process immediately (which is understandeable). Paradoxically, the fastest road to change is allowing detours on the learning road, with continuous, instant feedback and room for failure. Cherry, K. 2014. Self Efficacy (What It Is and Why It Matters). [online] Available at: http://psychology.about.com/od/theoriesofpersonality/a/self_efficacy.htm [Accessed: 28 Mar 2014]. Tiggelaar, B. (2010, October 19). Dromen, Durven Doen. Spectrum. YouTube. 2014. Ben Tiggelaar over veranderpsychologie. [online] Available at: http://www.youtube.com/watch?v=oEaXpDVjhBQ [Accessed: 28 Mar 2014]. Satir’s model for change and the role of school leaders. Virgina Satir, a family therapist, developed a model for change (Satir et al, 1991) from her work with individuals and families. She observed individuals and families that were confronted with a wide range of changes. From her observations she distinguished a number of phases when individuals are confronted with change. The initial state is one of reasonable status quo. The normal state of our (human) mind is chaos. Contrary to what we would like to assume, our mind is in disorder (Csikszentmihalyi, 1990). Since this state of psychic entropy is far from pleasant, we keep searching for ways to re-establish a purposeful order in our minds. This results in the “status quo” Satir refers to. But the negentropy (state of order) is threatened when something new enters the system. This foreign element, as Satir calls it, causes a period of chaos. During this moment of chaos, all kinds of feelings enter the world of the individual: anxiety, despair, anger, all kinds of fight or flight reactions. But at some point, often when things have reached their worst, an insight or idea emerges and provides a direction of “the way out”. Interesting remark: in Chinese, the word “crisis” consists of two symbols: one representing danger, and the other represents opportunity. The period of chaos turns into an opportunity to learn, the foreign element that disturbed the order is accepted for what it is and is no longer perceived as dangerous. Interesting would be to look at that turning point in the perception of the individual. When exactly did it turn over to the positive side? That kind of waking up, seeing the change in a different, more optimistic light? Also important: in what conditions did this take place? Can we create the right conditions so that the “danger” becomes “opportunity”? Because, after this mental click, the individual can begin the journey of integration (Satir, 1991. Weinberg, 1997). So, the flipping of the mental coin is an essential turning point in the process of transformation. From then onwards, the foreign element can be integrated through practice, and the new status quo is born. Note that the new status quo is of higher performance level than the late status quo. Imagine an experienced teacher who has got it all under control. At a certain point, the young, new headmaster comes up with a number of innovations. I’m sure you can think of an example, perhaps something to do with a flat mobile 10 inch device. The enthousiastic head “saw the light” in some workshop at a conference, and immediately takes action (phase 5 of Kotter’s 8 steps, remember this post). What is the effect of this foreign element on the mind of the experienced teacher? It threatens to dis-order his balance, his mental order. An order that was preciously, cautiously and probably very wisely constructed. Hopefully, the experienced teacher can quickly flip the mental coin and start to look at the innovation from the integration perspective. But better would be, imho, that the head was aware of the process at hand, and was able to create the right conditions (trust, curiosity, connectivity and tenacity) for the experienced teacher to limit the feelings of distress in the chaos phase. First, the head needs to know this. This is a matter of knowledge. When you don’t know that it works this way, it is a very logic reaction to fly off, and force the innovation down people’s throats. Are heads of school departments trained in these matters? I don’t think so. Considering the importance of leadership in schools (please don’t confuse with authority) and the upcoming educationaI reforms in Flanders, I would place my bets at the professional development of headmasters, ás well as the professional development of the teachers. 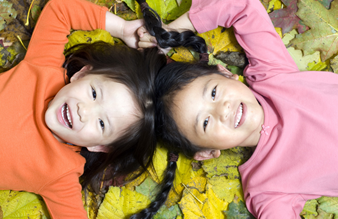 For the sake of our biggest treasures: the kids themselves. Cameron, E., & Green, M. (2012). Making Sense of Change Management: A Complete Guide to the Models Tools and Techniques of Organizational Change. Kogan Page Publishers. Csikszentmihalyi, M. (1990). The psychology of optimal experience. Harper & Row, New York. Csikszentmihalyi, M. (1993). Why we need things. History from things: Essays on material culture, 20-29. Roels, J. (2012). Cruciale dialogen. Maklu. Weinberg, G. M. (1997). Quality Software Management: Anticipating Change (Vol. 4). Dorset House, New York. In my previous post I wrote about my reading plans at the start of the IC2 module in my TELIC journey. IC2 stands for Innovation and Change 2. The previous module TEL2 focused on the relation learning <> technology in social contexts. This time we’re diving into the actual change process itself. Change-transformation and its underlying processes have intrigued me for years. What is at the root of human resistance for change? To me, it points towards this: change threatens our inner, mental order. New information entering our consciousness either creates disorder (entropy) or frees up energy in our minds. I hope to learn more on this in IC2. So, I’ve been reading Csikszentmihalyi on the anatomy of consciousness, following sessions with @janbommerez, and @johanroels and @charliepalmgren introduced me to the creative interchange process and the vicious circle. ‘Creative Interchange is the dynamic process that brings about transformation in human life.’ (Palmgren, 1998, p.1261). Last year we’ve organised some sessions on creative interchange and the counterforce at work: the Vicious Cycle. Reminds me of writing about The Chicken Conspiracy for IC2! This book describes the origin of stress and organisational mediocrity. I will take it up in another blogpost. For now, I finished reading John Kotter’s Leading Change. 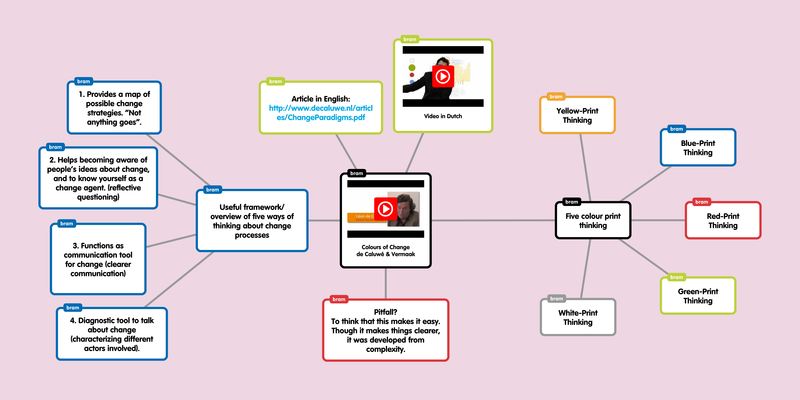 Very interesting, I made a summary in this popplet. John Kotter provides an 8 step plan for successful transformation in organisations. 1. Establishing a sense of urgency: are teachers, headmasters (and pupils) truly determined to change? I don’t think so. I think too often there is a common sense of complacency with teachers. “It is not all that bad, a kind of sleepy contentment with the status quo”. True urgency is driven by the determination to win, not anxiety about losing. 2. Creating the guiding coalition: putting together a group with enough power to lead the change. On macro level, politicians perhaps have the power to lead the change, but I honestly have the impression they are driven by the power itself, and not the actual transformation in favour of our biggest treasures: the kids themselves. On school-level, there is actually no “guiding coalition”. At best there is a group of reformers lead by an innovative headmaster, but a lot of the teachers are left out of the coalition, and they block progress. Schools have got ‘atypical’ organisational structures: one or more headmasters and many, many, many others: teachers, parents and children. This inequality in numbers makes creating a guiding coalition hard. 3. Developing a change vision: very often there is no shared vision. Perhaps there is a vision, indeed, but it is far from shared! Truly shared, I mean. Some staff meetings and brainstorm sessions don’t do the trick. Listen to the real culture-talk in the toilets after one of these staff meetings, and you’ll know what people really think. A vision should provide real guidance, it should be a safe and easy reference for every innovative action in the school. 4. Communicating the vision, not once, ten times, but hundreds of times the vision needs to be communicated. Again, this is not the case for most schools. Undercommunication and inconsistency are ruling. Reason? We don’t have the time (we think we don’t), and we underestimate the importance of this phase. This a matter of knowledge. Headmasters are not trained in these matters. Also, actions speak louder than words. Do teachers and school leaders “walk the talk”? Nothing undermines a communication program more quickly than inconsistent actions by leadership. 5. Empowering broad-based action: many people indeed work hard, very hard to improve and transform their organisation. I’m the first to say ‘thank you’ to those people. But since step 1 to 4 are neglected, the hard work is not efficient and transformation is blocked. This fifth step is about removing as many barriers as possible and unleashing people to do their best work (Creative Interchange process). One example of a fundamental structural barrier: the tenured teacher with a fixed mindset. The system allows that teachers who don’t deliver quality can obtain full tenure. But there are many, many other structural and systemic barriers. A decent diagnosis of structures, systems, staff, style/leadership is needed before you can start removing barriers. Again, the leader is key, but headmasters are not trained to do so. 6. Generating short-term wins: creating visible, unambiguous success. There are already many classroom innovations and good practices of educational transformation. Great! But the problem is they result from (groups of) passionate individuals. They are not embedded in the bigger whole that results from steps 1 to 4. When those “passionata’s” stop teaching/working, often the innovation also ceases to exist. 7. Don’t let up: consolidating gains and producing more change. Be aware of the forces that re-inforce complacency and the status-quo. Even if you’re successful in the early stages, regression may still follow. Producing more change when the first steps are not fulfilled is futile. 8. Make it stick: sustained change. New practices must grow deep roots. Roots are often not deep enough. The result is people download to their old routines, and fundamental transformation is blocked. The social forces at work in cultures are strong, very strong. Book closed. 1. Hagan, S., & Palmgren, C. (1998). The Chicken Conspiracy: Breaking the Cycle of Personal Stress and Organizational Mediocrity. Recovery Communications. 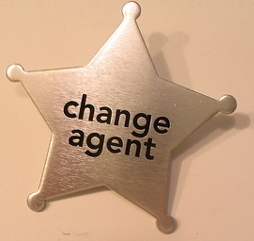 The role of the change agent: what, which types, key characteristics. A change agent is anyone who has the skill and power to stimulate, facilitate, and coordinate the change effort (Lunenburg, 2011). It can be an internal employee or it can be an external one. At the start of this new IC2 module, it is a good idea to look a bit closer at this role of change agent (consultant). Outside pressure type: from the outside of the organisation, this type often provides more radical change options. People-change-technology type: the focus of the change agent is the individual. If the individual changes its behaviour, the organisation will also change. Analysis-for-the-top type: focus on changing the organizational structure to improve output and efficiency. Many managers take up this role. Organization-development type: focus on internal processes such as interpersonal group relations and communication. Cultural change approach. Also taken up by many managers. In my experience, changes in educational contexts (schools) are way too informal. In Flanders, a change agent is not "present" in schools. Most likely, it is a headmaster or an innovative teacher/ICT coordinator. There is no role of change agent explicitly assigned to people. This is probably one of the reasons why change in school culture is so difficult. Holland, Matt. "The change agent." (2000): 105-107.